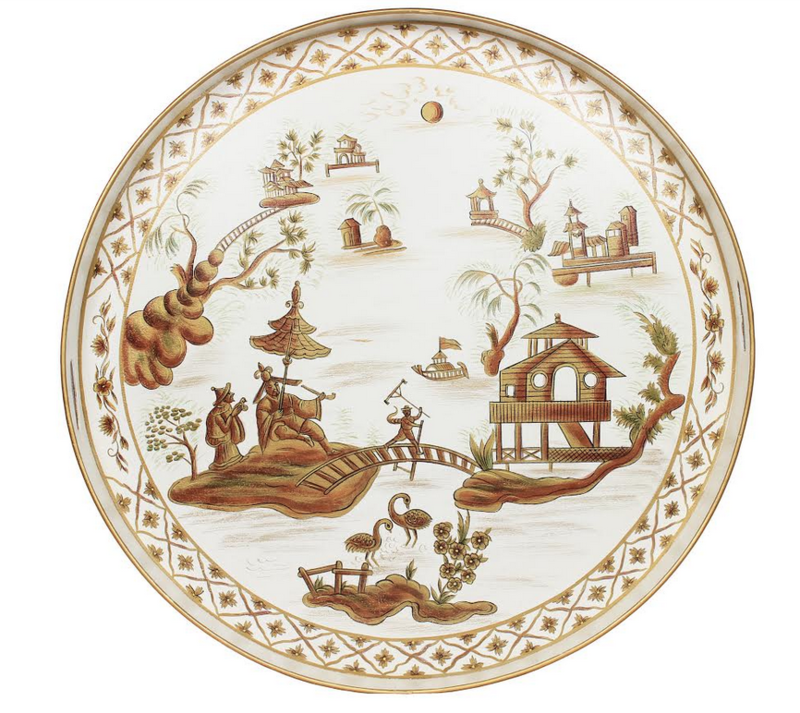 The chinoiserie tole and provence presale is on plus a giveaway! Hello! I cannot tell you how excited I am about this tole container…it is chock full of all kinds of beauty to help make your spring time spruce ups around your house all the more beautiful. It has me dreaming up of all kinds of ways to use some of these stunning new arrivals. The planters are simply incredible plus I have some new items that I am really really excited about. This container will be here in 4 weeks and is already on it’s way. As I always do, I hold a presale which offers the entire contents at special pricing for 2 days. NEW PLANTERS So in love with both of these new style Provence planters. They are metal, painted with a weather resistant paint. They have four finials that screw on/off and four drainage holes on bottom. I recommend adding a sealer of some sort to insure maximum protection against the elements, though I have some that I have not used sealer on and they are fine (having been outside for 2 years and braving all the elements). ITEM 1A. This is a beauty, such a classic design. Done in a trellis/fretwork pattern, this planter features an elegant floral design on on all fours sides with large rosettes on each side and four carved finials. Offered in four fabulous colors including a beautiful new color, light taupe. ITEM 1B. This beautiful new style has a slightly more transitional feeling. I love The design with the fretwork and circle border, the finials on this one or not carved, think its very sharp looking. Offered in three great looking colors. ITEM 2. Have been waiting a long long time for these and boy, were they ever worth the wait! 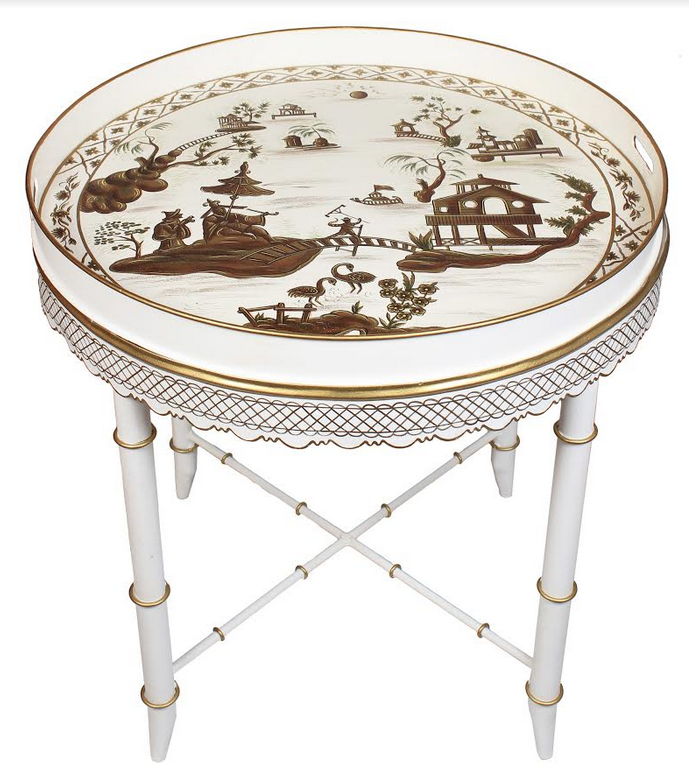 The fabulous new round handpainted tray table is finally a reality! So excited for it’s arrival. Offered in two beautiful color combinations, blk/gold or ivory/gold. Love the bamboo legs, beautiful, elegant and functional. Includes removable top round tray (24.5″ round) that can be used separately. This works two ways, either as a tray table or you can remove the tray use as the ultimate stylish serving tray! ITEM 3. Fabulous new bathroom accessories and a new planter. Love how elegant these are, can go with a variety of styles. Offered in three beautiful colorways. The pierced metal work is really something and highly detailed. All pieces are hand painted! One very lucky tole loving reader will win this fabulous new arrival, this gorgeous square planter which is prefect for boxwood balls or planted with your favorite flowers, great catchall as well! Just leave a comment on this post telling me your most favorite item here and you will be in the running! Winner to be announced on Sunday. To place an order you can call or email. Thanks for stopping by and wishing everyone a fabulous day! Love all of the tole pieces – especially the tray table! I absolutely love the tray tables! All of the new items are pretty! 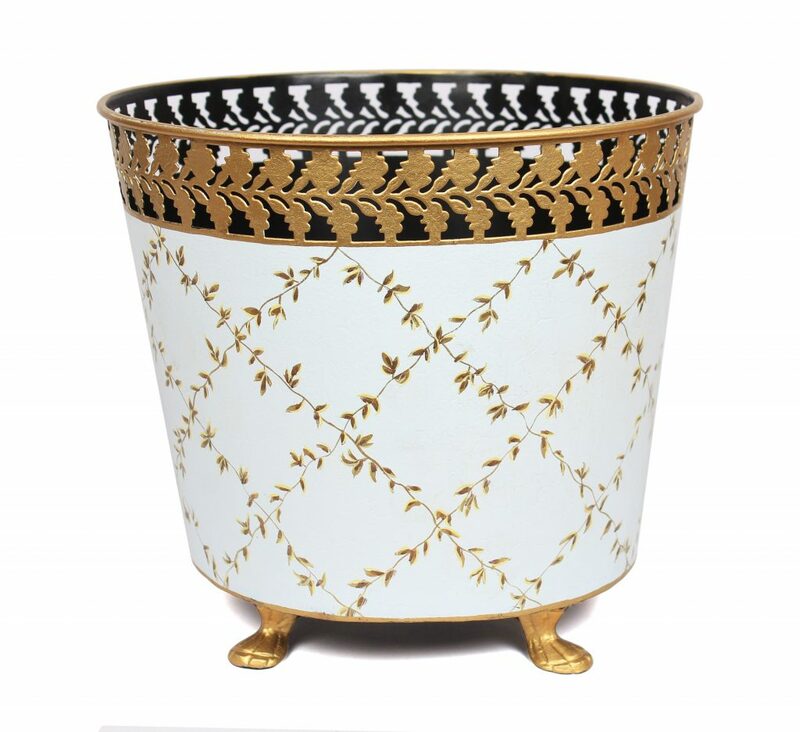 The planters are outstanding–such a classic design. Although we’re expecting more snow, seeing this post is a reminder of the planting season ahead! Beautiful tole pieces. Would you consider having oval tray tables made? 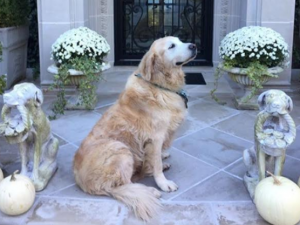 It is always such a pleasure to see the sweet pictures of your precious dog………my heart still grieves for your lost. Loving the light taupe planter! Neutral and classic. I love the black tole tray table-so versatile and would look great in any room of the house! Love the little feet on the planters and wastebasket! I love the first of the planters with the flower motif! I have a pale yellow house with white trim and black door we took the shutters off. I am just deciding which would look best! I really think they are so sophisticated! The new tray tables are stunning. So many uses! 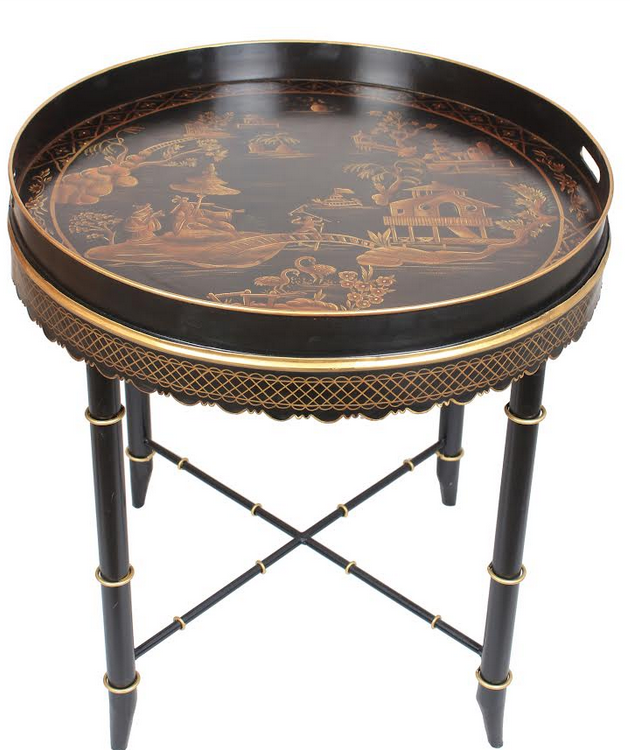 Love the new “Round Handpainted Tray Table” in black. It like that you can remove the tabletop to use as a tray for serving. Very versatile. Love those gorgeous garden planters,,, you nailed it Tina. The ivory planter is my favorite. Would look lovely with a tulip arrangement! They are all very pretty. Love the tray table and the bathroom accessories. The planters are gorgeous too. I love the tray table and the bathroom accessories. My favorite item is the square planter! It would look beautiful with some white hydrangea flowers! Love them all, each piece would make any room shine with the spring vibe. I love the classic Provence planters. They would be a wonderful addition on my front porch. Is is possible to know the dimensions of each? That would be most helpful. Thank you for all the beauty you share. love them all but partial to the planters, so pretty. I love the planters with circle detail. And actually the giveaway is my favorite tole product! Love the black planters. Would look great with any greenery. The black tole tray table is timeless and so practical. Love it! The black trey table. Very pretty. Love the planters they are so classy. My new covered patio is screaming for the pale blue/gray. Love it! I love everything! The tray tables are my favorite! Love the black and gold tray table! Be still my heart. The taupe planters are gorgeous and will be beautiful on the patio. I really like the bathroom accessories – the gold detailing is beautiful! I just love the tray tables…can think of so many uses for them!! I just love the footed wastebaskets! One for every room! All are lovely but I think the black tray table is a standout. 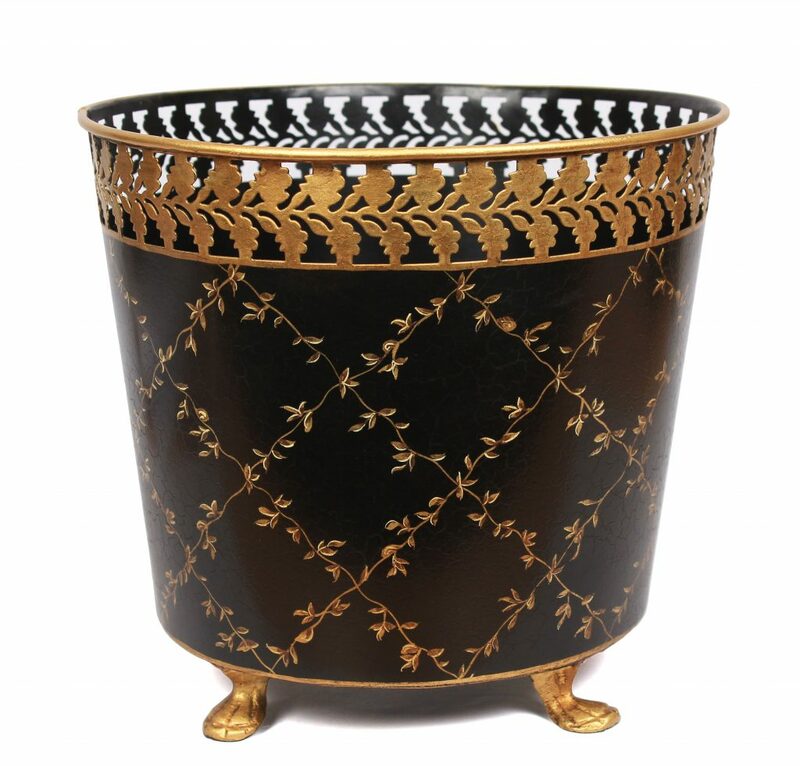 Love the black planter (Item 3)! The trellis design will complement any plant. The final picture each day of your beloved pet is always so special. All are lovely but I think the black tray table Would compliment any room. My very favorite is item 2 in black. Love it! Love the new tray tables! I love the round tray table in ivory and gold! All the items are fantastic. Especially love the round told tray. Love, love, love Item 1A in black. 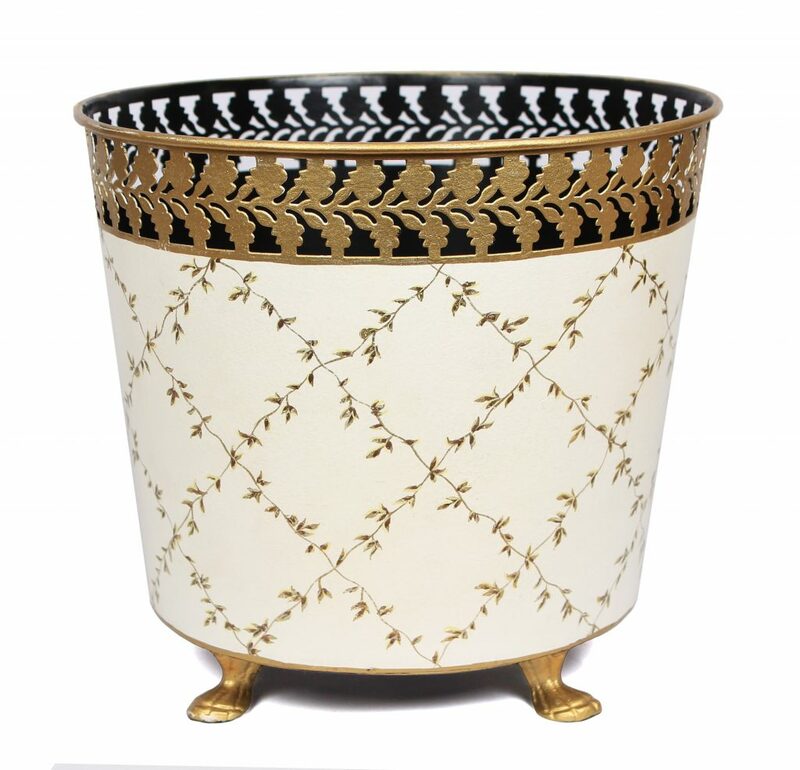 I love the ivory wastepaper basket, and the ivory planter in the same design! I love the tray table, and I love both color ways. Thank you for your beautiful blog and fabulous shop. YOUR TRAY TABLES ARE THE MOST BEAUTIFUL !!! I CAN TRULY SAY AS NICE IF NOT NICER THAN MAITLAND SMTH. QUALITY IS RIGHT ON…. I love the tray table and the outdoor planter’s. All the new items look beautiful! I love all the pieces, they are so beautiful. My favorite creamy white planter in the trellis/fretwork pattern. It is so gorgeous and would look amazing on my patio by the pool! Fluffy rolled finger tips brimming to top of square planter on my master bath vanity. So luxurious! oh good grief…… you want us to pick a favorite ?! All are so beautiful.. The tray table is really wonderful in both colors! I think the tray tables are fabulous! Love that you can remove tray. 2 for price of 1! 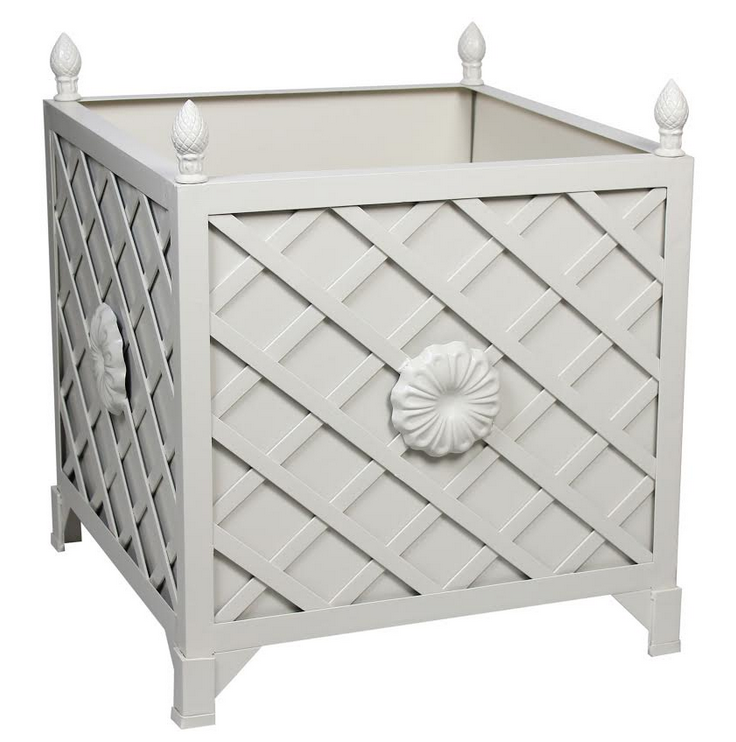 The trellis planter is DIVINE in all colors but the creamy taupe is my favorite! I love all the new planters and waste baskets! 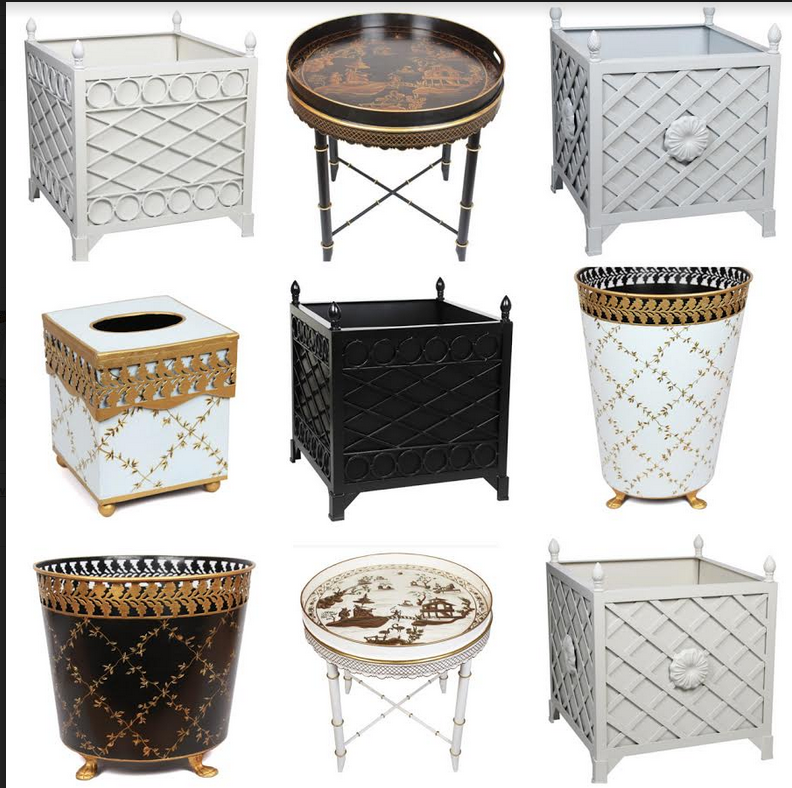 All of them are lovely but if I must choose I really like the ivory planter. I love, love, love that black tray table! Fabulous! Love it all, but if I have to pick a favorite, it’d be the ivory table! Ivory tray table … fabulous! I could not choose one but my favorites are the provence planters and tray tables, love the bathroom pieces too- what can I sat I love it all. Well done Tina. 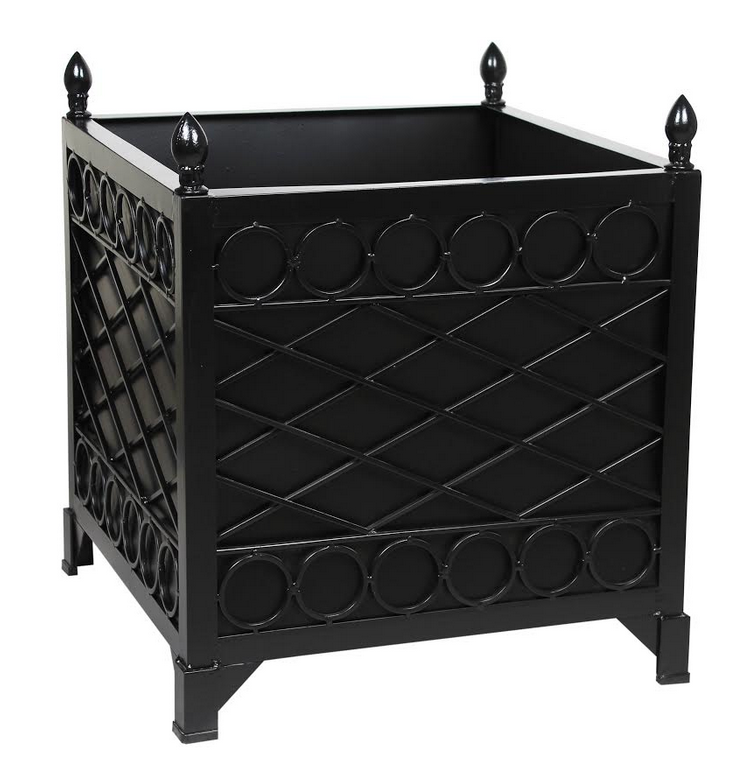 The trellis planter in black is just stunning! 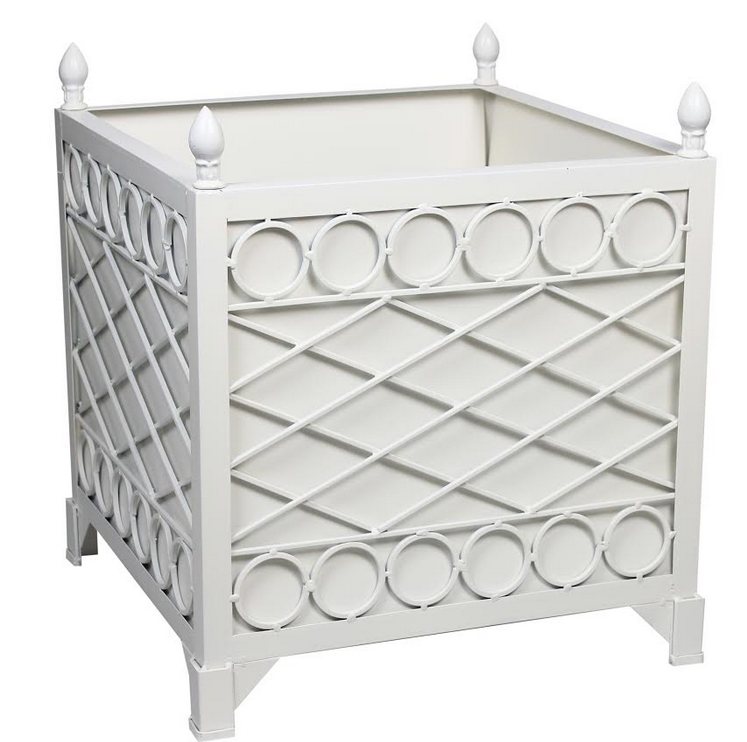 I love the trellis planter in white! All of the pieces are just gorgeous. I am so glad you are carrying wastebaskets at a good price point. So pretty. I love ALL of these pieces! The planters are beautiful! Love the 1A Provence Planters! Who could choose just one! They’re all great!!! Love following you on istagram. The role tables are beauties! Who could choose just one! They’re all great!!! Love following you on instagram. 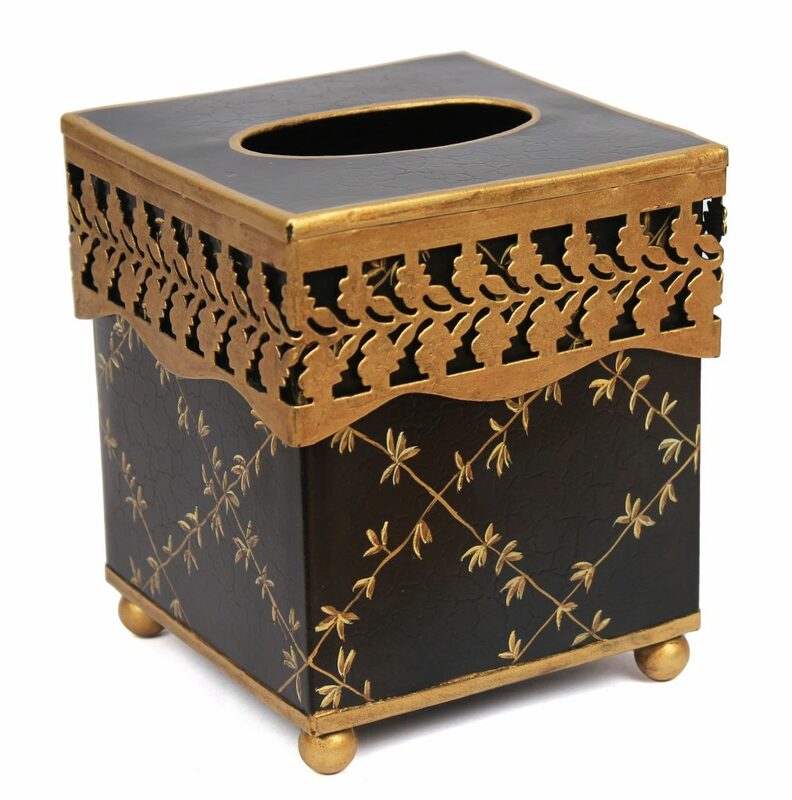 The black wastepaper basket and tissue holder are my favorites this time. They could really spruce up a powder room to the next level. The new tray tables are amazing and so versatile. I really love the planters with the rosettes. Used inside or out. The tray table is stunning!! my heart goes pitter patter every time i see your beautiful new wares. I love the planers and could see them by my new pool (hopefully will be done in June) but truthfully they are ALL just beautiful. Love all the pieces but the tray table calls my name! I think the pale blue tissue cover and matching wastebasket would be so elegant and feminine in a powder room or master bath! So pretty! I really love the trellis planters!!! I love the round tables. I am having a hard time deciding on. Color and where I would use it. I have down scaled homes and now I have to think about that. It’s one or the other because I want one of them! Oh my goodness! Each piece is magnificent. Wish I could have them all. Love your tole!! Oh boy, payday is tomorrow. Tina, your planters are lovely. I am deciding what to plant in them………either a seasonal insert or an evergreen. Love the tray tables! So pretty. I love the black and gold tray table. It is beautiful. Wow, all items are lovely. I especially like the tray table. So versatile. Love the white and gold. Love them all but the black tray table is awesome! I actually love the square planter the best – all very nice though. The planters and the tray table are exquisite ! LOVE them. I live the black square planter boxes. 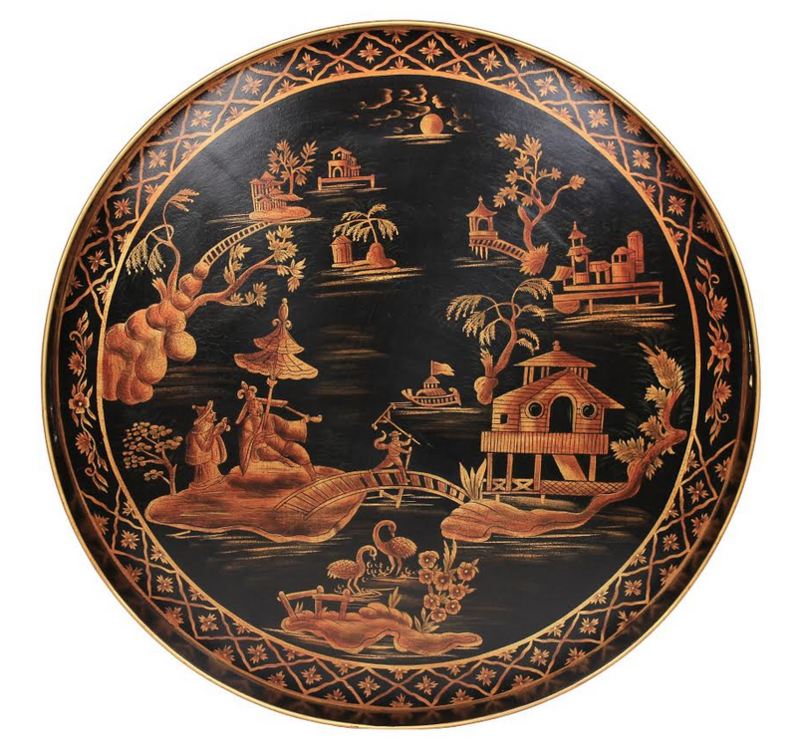 My favorite item is the black ,round, hand painted tray table! Stunning! A future heirloom for sure! Item 1A in Black. So classic and beautiful!!! I inherited lovely old fretwork planter boxes and yours are fablous!!! But my favorite item here is the black painted tole tray table…a classic! Love your style and have enjoyed your blog since you first began! Thank you for adding beauty and fun to my day. Oh my the table/tray is darling! Dreaming of finishing our backyard landscaping project even though it’s currently under 18″ of snow! Had already designed the space to allow for Provence planters and can hardly wait to get the hardscaping done and planters in place and filled with boxwood, alyssum and ivy! Loving the ‘bamboo’ legs on the new tray tables! As always, your new arrivals are stunning and so very unique. I love the small planters featured at the end of your post. I can imagine so many different possibilities in them!!! So hard to choose! I love the tray tables.-useful in so many places. Thanks for bringing beauty into our lives with each post! Love the tray table and the price! I have trouble shopping because when I pull up a catagory there are ads all over the pictures???? I love the entire collection!! So beautiful!! But, my favorite is the black tray table!<3 It's the perfect addition of interest and elegance. Plus, I like to add a splash of black & gold to almost any color combination. I LOOOOOOOOVE THE TRAY TABLE BOTH IN BLACK OR WHITE. Just GORGEOUS!! Love the white tole planter—a lovely updated look to a classic! 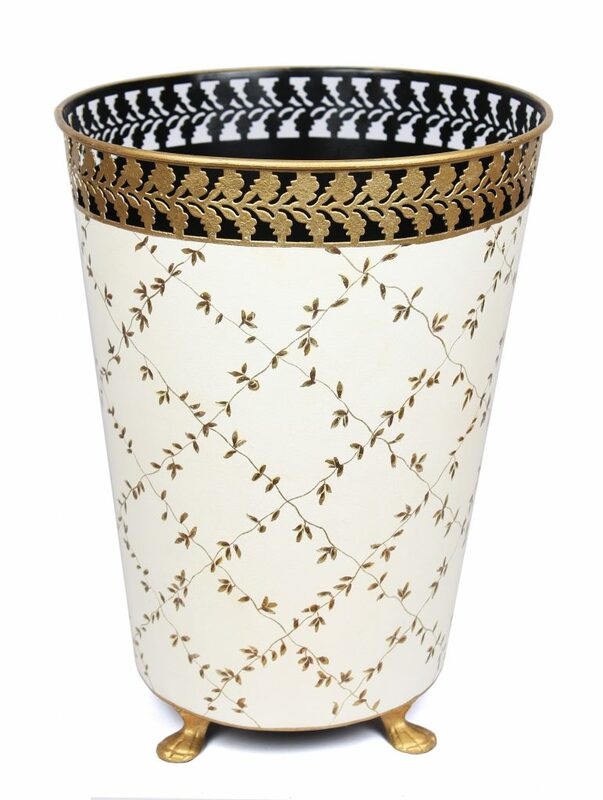 Creamy white planters with the floral finish are so classic and beautiful. As we start to put our new very old house together, I hope to have some flank the front door with topiaires. 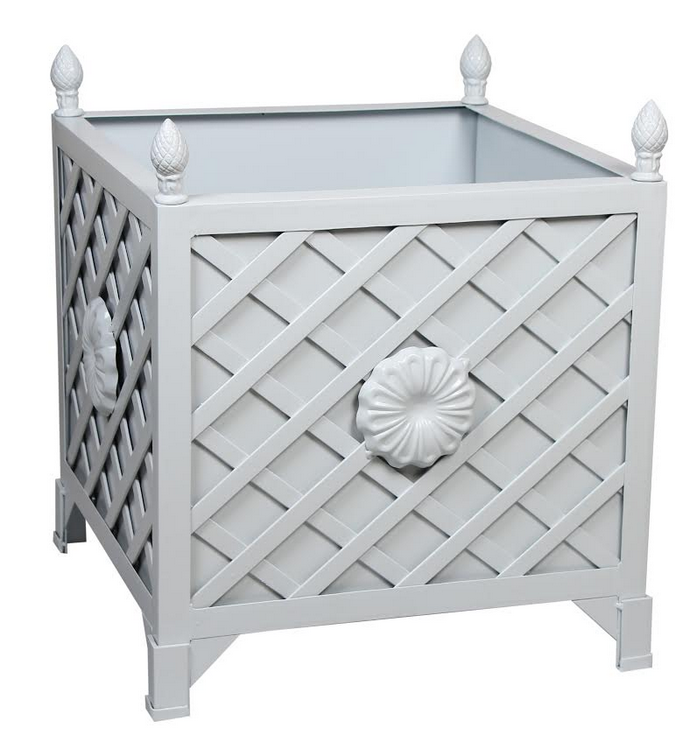 The Provence planters in pale blue/grey are to die … Great new pieces! 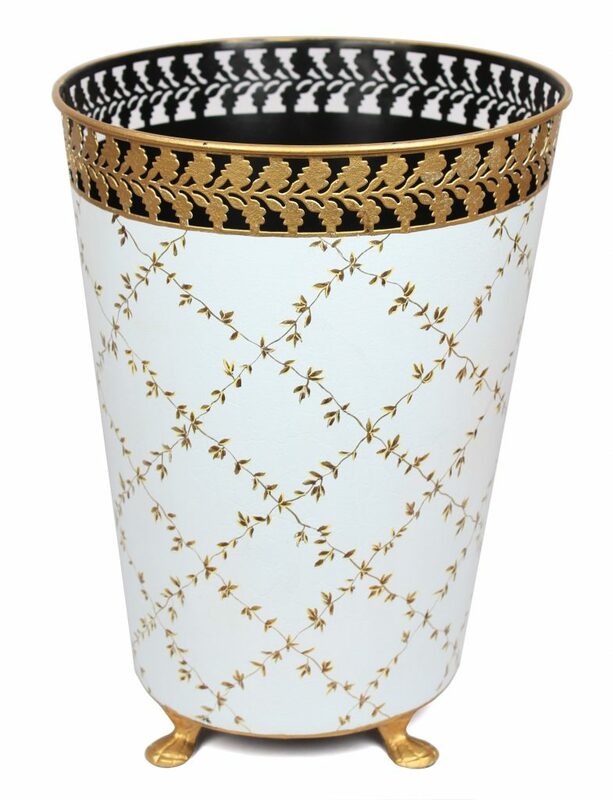 The tole wastebaskets are wonderful, as it is almost impossible to find a stylish wastebasket! And these are downright elegant! Love. Can see it now; a good book in hand and a cup of tea sitting on the round tray table as I curl up in my favorite reading corner. It’s all so beautiful….love the black toile !!! I love planter ITEM 1A in pale blue/gray. BEAUTIFUL! Tina, I just LOVE your Chinoiserie Tole. It’s so lovely and such good quality too! Well done! All pieces are totally fabulous, they are so elegant and beautifully detail! I adore the handsome black wastebin. It’s so elegant! Great design, thank you! I adore your tole collection, so elegant. I especially love the round tray on a stand. Gorgeous. 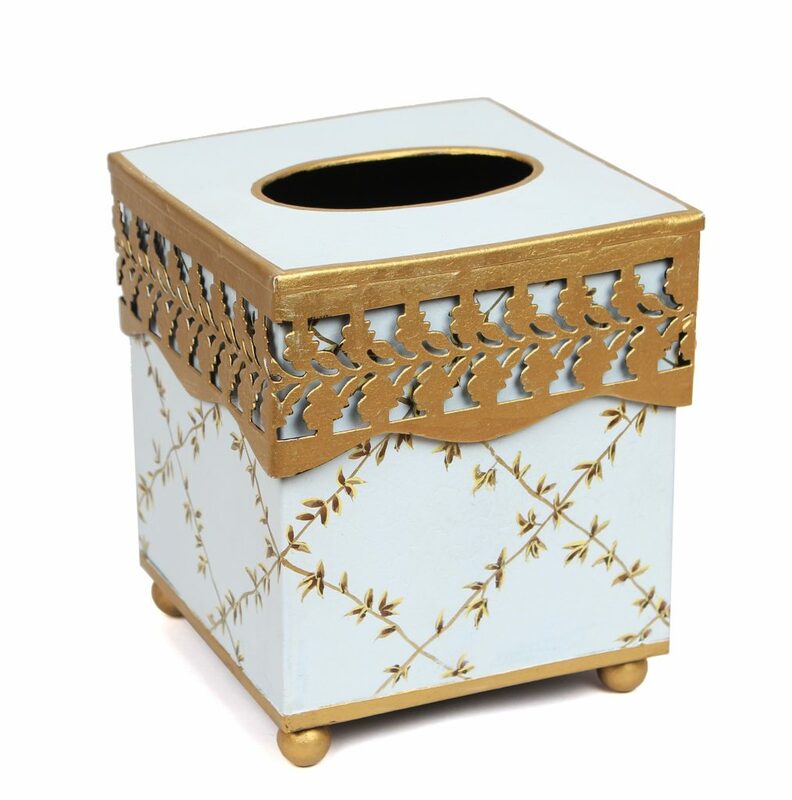 I see that you do a tissue box holder in tole and was wondering if you had thought of doing one in Chinoiserie porcelain? I could see a blue and white and a gold and white one selling well. I love the square planter! It’s lovely! All the planters are though! Beautiful pieces! 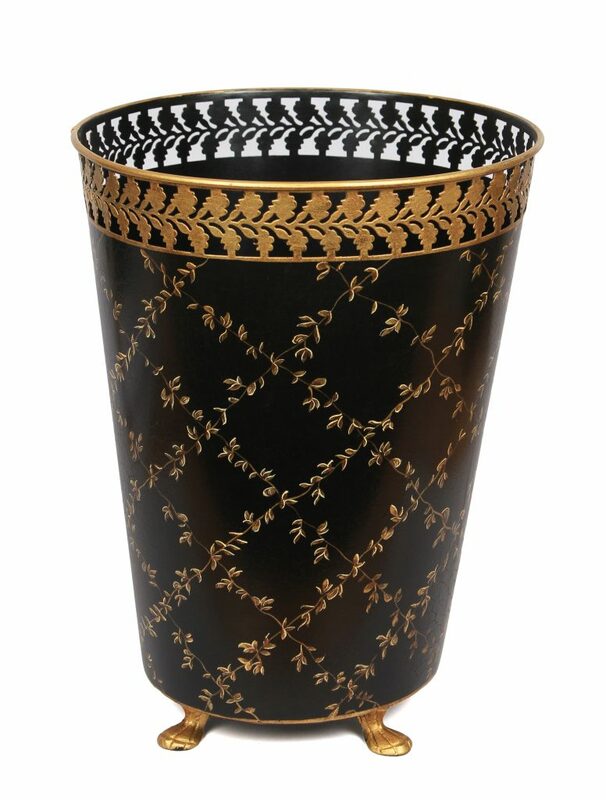 I love the trellis planter in black and love the tole wastepaper basket. Everything is lovely. Thank you. My favorite item would have to be the tole tray table! I love the size, design and versatility! The black would look great in my home. I just love it all, but the black tray table is my favorite!! I can think of 2 places I could use that!!! While they are all gorgeous, I love item 1b in black and in white! I think they would look fabulous around our low country home. Classical with a slightly modern twist – well done! Love the new wastebasket and planter! I would use the planter for bath cloths in my guest bathroom. Love the 3 piece tole set. I love love love the black tray table. All your items are wonderful as I adore the ornaments I got at Christmas. Your planters are beautiful. But your hand painted tray tables are exquisite!! My favorite is the off white tissue holder. Love the tile tray tables. Such a classic. Hi Tina! Lovely collection, as always- my favorite is the black tole planter. Looking forward to spring and real flowers inside are a must for me. Of course if I win it, I’ll have to buy a second for a pair! I absolutely love the tray tables. I can just see a beautiful orchid placed on top or it used to serve drinks to guest. Absolutely beautiful! I love the black bathroom accessories! Classic and beautiful! Fabulous tray tables. Also, tissue holders are a great addition. 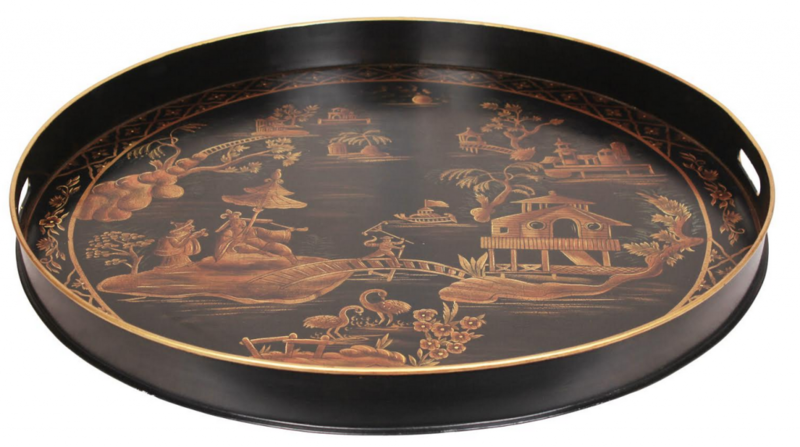 Please consider creating a fancy black chinoiserie mirror for use in a living room over a block front chest……similar to one that was featured in a recent photo you posted. It would go great in our taupe rooms. Can’t find a nice one anywhere! Thanks. Love the black planters ! Would love to have the tole planter on my kitchen island! Wow! That table is just gorgeous! The tray tables are divine! My favorite item is the black hand painted tray table. Beautiful! I adore the new Provence style planters!! Can’t wait for the day my budget allows for two of them at my home!! Beautiful update! I really like both of the tray tables, but I absolutely love that planter! It is beautiful and such a timeless piece. All so gorgeous! Would love to see a tole tray table at bar height (or even adjustable!) to use as a secondary service/clearing tray in my dining room and at parties. Well the truth is that I would love to own all of the items. 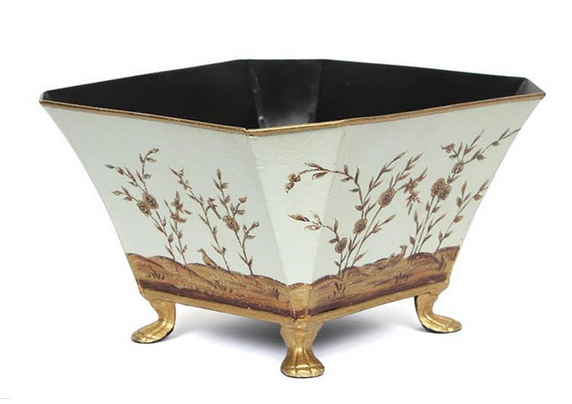 I will choose the toile planter in black! 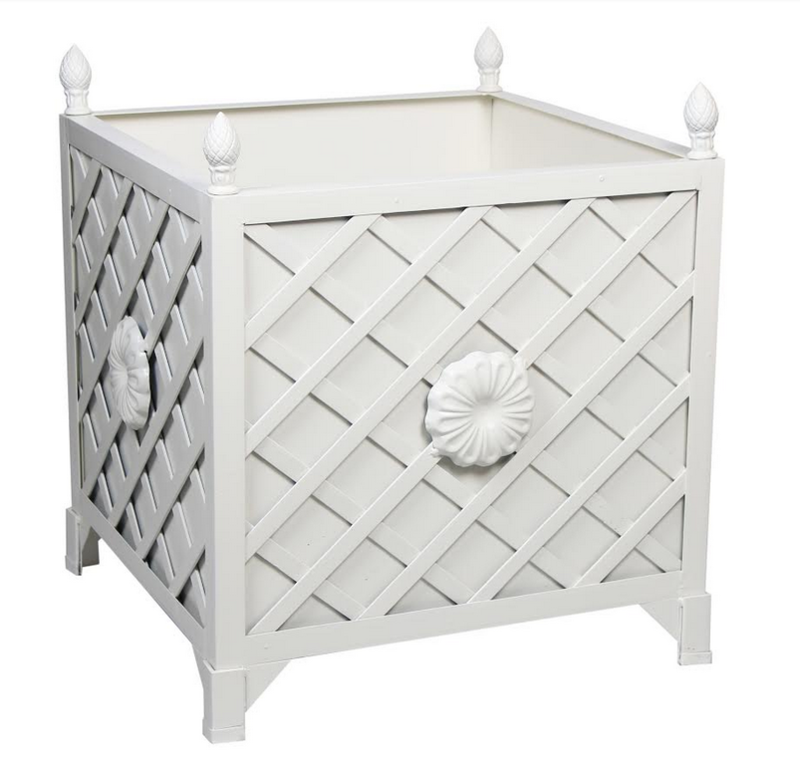 Oh Tina….they are all so lovely, but I would have to say the new Provence planters with the rosettes! The tray tables are absolutely beautiful! Loved the large Province planter in light taupe. It is a classic! I love the toile . Looking forward to my wastebasket. The planter would look great in my living room with a stunning phaleonopsis and lots of moss. Love it all, but have to say that beautiful tray table is my favorite. All the black tole is amazing and so elegant. Favorite is the tray table for sure! 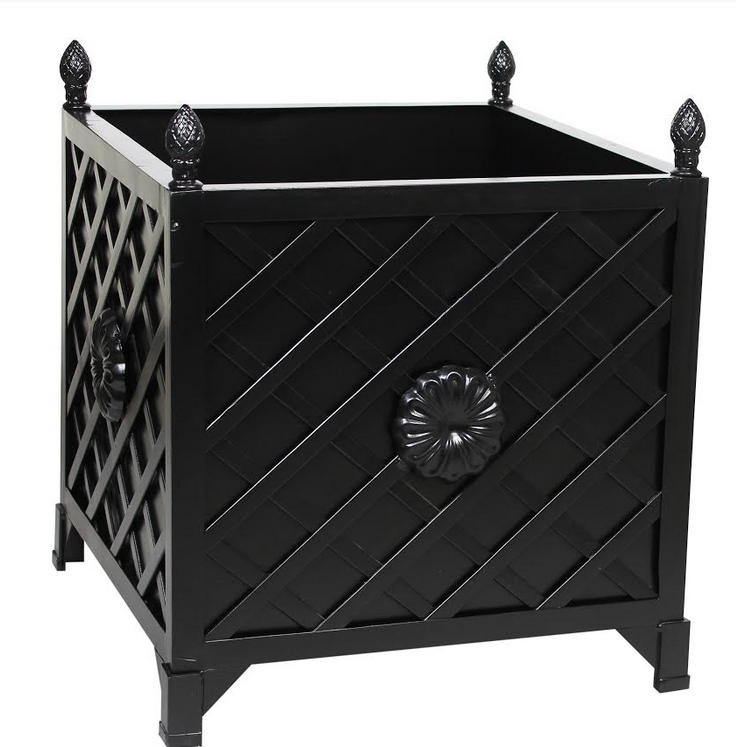 I love both planter styles in the black finish! Tina, I’m in love with the ivory/gold tray table. I have the perfect spot in my bathroom for this table. Thank you for this opportunity. Love your blog! I love the pale blue tissue box! Elegant, pretty and so affordable! I love the black tray table! In love with #2 the round tray table. 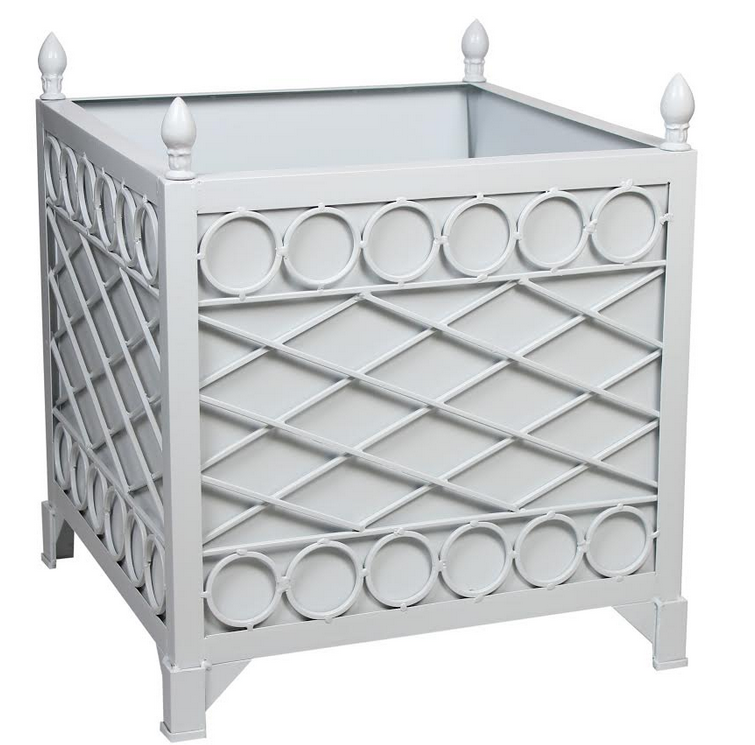 Perfect little side table….now to decide on what color! Planters are my favorite. Love al the color options! All the items are beautiful! I would have a difficult time choosing my favorite. Absolute eye candy! I love everything! I especially love that you made this in basic black and ivory, but also the pretty soft blue! Lovely! Perfect for so many displays! Tina everything is just lovely. My favorite is the ivory waste basket. But this planter would look great in my living room. 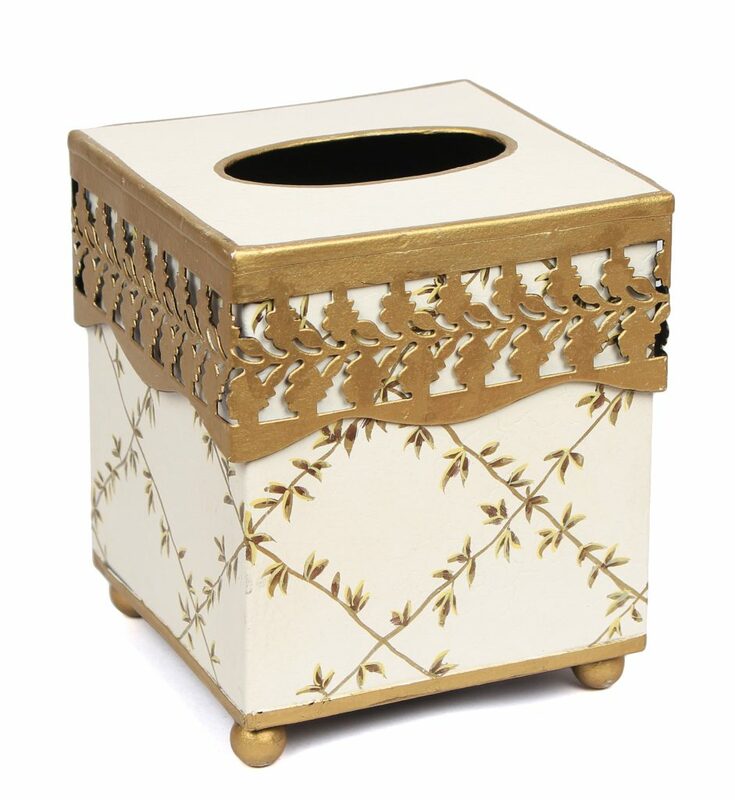 I love the planter item 1a in the ivory! Gorgeous!! Please let me know when I can purchase the new melamine plates!!!! Tole is so lovely and makes wonderful gifts for special people!!! Cream is my fav, but I do like the light blue for a change! !